Announcement Currently scheduling for early Summer 2019 and onwards. Rush order inquiries are welcome! Please include your ideal deadline, what pieces you are interested in, and quantity for printing. Currently scheduling for early Summer 2019 and onwards. Rush order inquiries are welcome! Please include your ideal deadline, what pieces you are interested in, and quantity for printing. 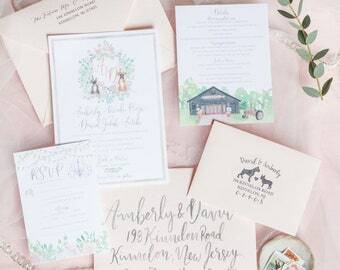 We were THRILLED with the invitations that Karli designed and printed for us...they exceeded all our expectations and our family and friends have been RAVING about how amazing our invitations are. Not only is she incredibly talented, but she was soooo nice and such a pleasure to work with. She was great at incorporating our feedback to ensure we were thrilled with every aspect of the design. I can’t recommend her enough! We are overjoyed with how our crest and save the dates turned out. Can’t wait to work with Karli on our wedding invitations! Thank you Karli! We are SO HAPPY with the save the dates Karli designed for us! A friend had Karli design a crest for her wedding that I attended last year, and it was so beautiful I kept her invitation. When I got engaged, one of the first things I did was ask who had made it! Karli was wonderful to work with - she took our scattered ideas of what we wanted and turned them into something beautiful and so special. she even got our cat Elvis Pperfectly. Thank you so much Karli! Custom orders are non-refundable. If your item is damaged in transit to you, shipping insurance will cover it, and we will sort it out with the Postal Service. Payment due within twenty-four hours of purchase. Items to the USA and Canada are shipped carefully packaged, and include tracking and insurance. International packages - if you would like to add insurance/tracking to your shipment, contact me and we can discuss your options. Buyers are responsible for knowing their Country's import regulations and customs laws.